Carl Knox, the 47-year-old who allegedly stabbed a man to death on East Fifth Street last week, turned himself in to police and is in custody, Deputy Inspector John Cappelmann announced at last night’s meeting of the Ninth Precinct Community Council. 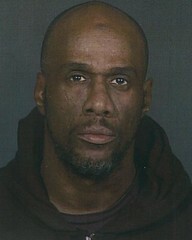 Mr. Knox, who turned himself in on Sunday at the 44th Precinct near Yankee Stadium in the Bronx, faces a charge of murder in the second degree. Inspector Cappelmann shared a few additional details about the dispute that led to the death of 31-year-old Corey Capers. Mr. Knox, who was staying at 737 East Fifth Street in the Lower East Side II houses, got in a dispute with the goddaughter of his girlfriend over the fact that she was watching television. The argument escalated to the point that Mr. Knox began abusing his girlfriend, and the goddaughter alerted a group outside of the building. The group then chased Mr. Knox to scaffolding in the front of 709 East Fifth Street, where he allegedly stabbed Mr. Capers. The neighborhood’s top police officer also shared a few more updates on crime in the area. The 39-year-old woman who was shot in the thigh early Monday had come to the neighborhood to celebrate her birthday. The victim had spotted two men, whom she did not know, arguing nearby an hour prior to the shooting. According to the victim, one of those men biked by and fired five or six rounds at the group. “We’re very fortunate no one else was hit,” Inspector Cappelmann said. The recent spike in robberies also came up at last night’s meeting. “Memorial Day weekend we got killed in robberies,” Inspector Cappelmann said, noting that there were eight that weekend compared with two during the same period last year. He expressed hope that new measures put in place had stalled the trend, and added that last week there had been only one robbery within the confines of the Ninth Precinct. And on the quality-of-life front, two attendees continued to raise concerns about the nomadic punks at Abe Lebewohl Park, who they say are generally a belligerent, unpleasant bunch. Police officers said they had visited the park numerous times, written summonses when possible, and continue to keep an eye on the goings-on, where the travelers share space with the decidedly more mellow vendors at the farmers market. “Their lifestyle defies common sense,” Lieutenant Patrick Ferguson said. Lastly, Lieutenant Ferguson pledged to pay a visit to Double Wide Bar on East 12th Street after two neighbors said rowdy customers and even employees were keeping them awake at night. Next post Video: 'Boardwalk' Buggies in Action!